Greenland, the world's largest island, is about 81% ice-capped. Vikings reached the island in the 10th century from Iceland; Danish colonization began in the 18th century, and Greenland was made an integral part of Denmark in 1953. It joined the European Community (now the EU) with Denmark in 1973, but withdrew in 1985 over a dispute centered on stringent fishing quotas. Greenland was granted self-government in 1979 by the Danish parliament; the law went into effect the following year. Greenland voted in favor of increased self-rule in November 2008 and acquired complete responsibilty for internal affairs in June 2009. Denmark, however, continues to exercise control of Greenland's foreign affairs, security, and financial policy in consultation with Greenland's Home Rule Government. 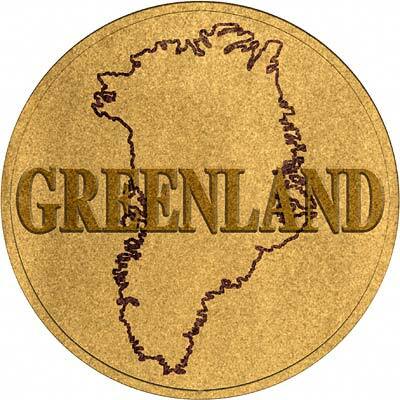 For silver and base metal coins of Greenland, please look at our original Chard Coins website. We make an active market in almost all world coins, gold or otherwise, including Greenland gold coins. If you have any of these coins to sell, please contact us, or post them to us for appraisal and offer.